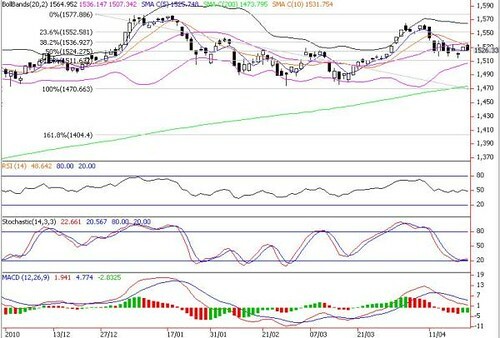 KLCI Is Still Optimistic OF Surpassing The 10-Days SMA And Mid Bollinger Band Barriers. Regional markets were mostly up, sparked by overnight rally on Dow amid strong corporate earnings and housing data. Contrary to the regional uptrend, the FBM KLCI fell 4.7 points to 1526.3, as investor sentiment was dampened by the 3% jump in March 2011 inflation and concern of a 25bsp hike in OPR in the 5 May MPC meeting. Trading volume soared 8% to 1.39 billion shares but value tumbled 18% to RM1.49 billion amid strong interests in lower liners. Despite yesterday’s disappointing performance, we remain optimistic that the FBM KLCI is likely to surpass the immediate resistance of 1531 (10-d SMA) and 1536 (mid Bollinger band) in the near-term after digesting the March CPI report. Since rate hike is in the card, doing it earlier would mean faster monetary transmission to “pre-emptively” arrest the inflation problem, which is positive to our market. Support levels are 1513 (61.8% FR), 1507 (lower Bollinger band) and 1500. The rally may take a pause if oil prices overshoot US$120/barrel.